There is nothing better than an easy meal after a long day, and a stir fry always hits the spot. This chicken stir fry has a healthy heat from the ginger. The chicken and the vegetables soak up the delicious flavors from the sauce. The perfect, easy meal for any night! Mix coconut aminos, water, garlic powder, onion powder, and ginger together in a small bowl until sauce is smooth. Cut chicken into pieces and place in a large bowl; add ½ cup sauce and stir until chicken is coated. Allow to sit for about 3 minutes. Add oil to the inner steel pot of pressure cooker and set Sauté mode on High. Add chicken to pressure cooker and sauté until browned, 2 to 3 minutes. Lock pressure cooker lid in place and set steam vent to Sealing. Select Pressure Cook (manual) and cook for 4 minutes on High. Press Cancel. Set steam vent to Venting to quick-release pressure. Remove chicken from pressure cooker and drain the excess water from the inner steel pot. Turn pressure cooker to Sauté mode on High; add broccoli, snap peas, bell pepper, onion, and the remaining sauce. Sauté vegetables until browned, about 10 minutes. 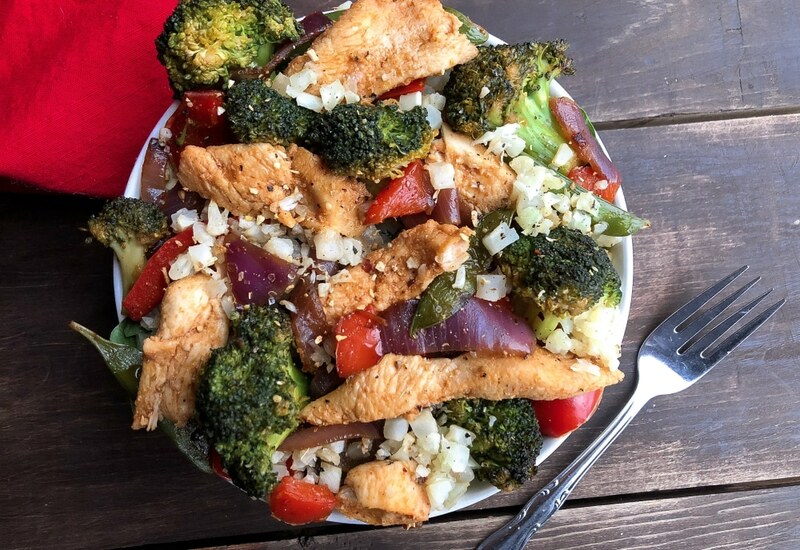 Serve chicken with just the vegetables or add cooked cauliflower rice or white rice. Substitute other vegetables such as asparagus, cauliflower, or green beans for the vegetables listed. Substitute chicken thighs for chicken breast for a slightly richer flavor. Add 1 tablespoon Sriracha for a spicy twist. Per Serving: 468 calories; 10g fat; 33.4g carbohydrates; 60g protein; 145mg cholesterol; 590mg sodium. This was a winner in our house last night! I used about 3 times the amount of ginger it calls for and also used 2 cloves garlic with the sautéed veggies. Used soy sauce instead of liquid aminos and white rice. Love the gingery flavors of this dish. Perfect for lunch throughout the week! Not heavy so doesn't leave me feeling lethargic for the rest of the day like some meat and rice bowls do. I'm adding this to my weekly rotation!